Summary: Soldiers come marching home. Originally written for fma_fic_contest prompt 44, placing second. Summary: A responsible soldier takes care to maintain her weapons for optimum performance. Hawkeye at home, shortly after the transfer to Central. Hey! First time posting in this community~ I hope you enjoy my graphics. Hi! First-time poster, big Riza fan here with some colored manga artwork. Warnings: None. Set exceedingly pre-story (even before the flashback sequences), this piece is AU to the extent that it ignores one of Riza's comments about her family in the opening panels of chapter 60. A/N: This story owes its existence to lyric_nonsense's fifteen-minute 'fic "To Serve and Protect", which prodded several latent ideas about Riza Hawkeye into closer proximity in my head. I had planned to write it as a fifteen-minute 'fic, too, but after the first three hours I gave that idea up. I should also mention the more distant inspiration of this story, with its piquant meditation on what young women really want. Many thanks to nateprentice for the weapons beta. Concrit welcomed with plum-cake, or perhaps a lunch box of my own invention. Crossposted from nebroadwe to Höllenbeck (i.e. hagaren_manga, fm_alchemist, _rizahawkeye_, fullservicefma, fma_gen, fma_writers and fma_fiction). Dedication: For cornerofmadness as YA early birthday present. (Hey, it's cheaper than booze and not half as fattening.) Many happy returns! "Now," the General said. "Watch closely. You may wish to cover your ears," he added, as he raised the pistol and sighted. X-posted liek EVERYWHERE...sorry for the flood! Summary: Roy and Riza visit the cemetery, and their old friend isn't the only one they're visiting. You heard him; he and the Major want some privacy. X-posted EVERYWHERE. XD Sorry for the friends page flood. Spoilers: Chapter 58 of the manga and above, but no spoilers for anime or movie. 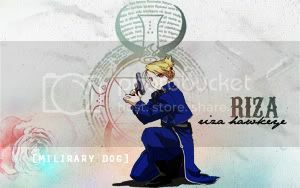 Summary: What role will Riza fulfill in Roy's dream of becoming a great alchemist? What were they like as kids? Covers events starting from their first meeting and possibly ending with Roy's alchemy exam. Ninth chapter // Roy wonders if the Hawkeyes are hiding stuff from him. Oh, and he teaches Riza a bit of piano. Spoilers: Although not everything up to the most recent chapter (74), close enough to it. Whatever chapters encompass the detailing of some of Riza's and Roy's past. Notes: A short, ruminating piece on a young Riza Hawkeye. A little dark, actually, but I like to think that I'm not the only one who's been wondering about Riza's upbringing. Sixth chapter // Roy has a groupie. Riza's father has a flashback. Fourth chapter // Mr. Hawkeye meets his future protégé, who is apparently also a piano prodigy. Fifth chapter // Four chapters later, Riza and Roy meet again during Roy's 11th birthday party. Third chapter // Now Roy wants to be a State Alchemist as well. Go figure. X-posted EVERYWHERE XD Sorry about the flood on your friends pages, everyone! Spoilers: Spoilers for the end of the anime. Summary: One rainy afternoon, Riza thinks of what had become of their plan. Summary: Riza's feeling a bit under the weather, but she won't admit it, especially not to Fuhrer Mustang. "Either her sight was deceiving her, or Riza didn’t look like herself today…her face looked pale and downcast..."
Spoilers: Spoilers for end of the anime and movie. Disclaimer: I do NOT own FMA in any way. That's why it's called fanfiction. Summary: Set during the aftermath of the movie, the Amestris Parliament sets their eyes on Roy Mustang to be their next Fuhrer. Unfortunately, it's not easy becoming Fuhrer. Meanwhile, Roy juggles his blossoming relationship with Riza and his quest to rule Amestris. "Today we are gathered here at Central Headquarters for a very important day – the day when we induct the next man to lead our wonderful country." “I, Major General Roy Mustang, do hereby promise to govern and serve the country of Amestris and its people, to keep them safe from all harm and discord, and to use my abilities for the better of the country." Spoilers: Spoilers for the end of the anime AND movie. Notes: I like to mess with the movie plot, so there. XD And yes, Roy for Fuhrer! Summary: Set during the aftermath of the movie, the Amestris Parliament (OC-heavy) is thrown into chaos and decides to choose a new Fuhrer after all. One man is brave enough to take on the job...but what he doesn't know is that he's actually the only man brave enough to take on the job. And the process is anything BUT easy. This was just something crazy I came up with when I recieved a request from KT Rose about the secret talents of the Military dogs. I think this is my first post in this community. I am not sure. lol Please let me know if there are any typos grammar mistakes, etc.